Hold up, I ain’t trying to stunt, man. But these Yeezys jumped over the Jumpman. 2 more hours to go before the raffle. I was in Sole Academy – Bonifacio High Street last Saturday afternoon, after being selected as one of the few (hundreds) that were in for the raffle presented by adidas Philippines and the sneaker boutique. Everyone brought their A-game when it comes to wearing their best adidas sneakers, which was one of the requirements when you’re name is drawn and you have a chance to buy the new Yeezy Boost 350. Y-3s. Classic Stan Smiths. ZX Fluxs. I even got to see the Yeezy Boost 750 in person, from a guy wearing a black t-shirt with Kanye West‘s face on it (shout out to you, fam, for going on full Kanye level). Hundreds were in front of the store a couple of hours before the raffle draw. Some people were already thinking of the resell price that these would fetch in the market. Others shared their Yeezy stories, and how they became a fan of West. You could feel the hysteria for a shoe that is priced at $200 (retailed at Php 11,495). I couldn’t believe the hype. How can a guy who’s been called a “jackass” far too many times (even by his own president) have this many followers? How can a dude who’s been in the news for the wrong reasons hold the sneaker world at the palm of his hands? How can Kanye West be so influential in a booming industry, having more power than any current NBA players or sneaker designers? To understand the hype, we first have to understand the man himself. In Chicago, Kanye West emerged in the 21st century as the “go-to” producer with the freshest beats for the likes of Jay-Z, Ludacris, and Janet Jackson. He was young, smart, musically-talented. 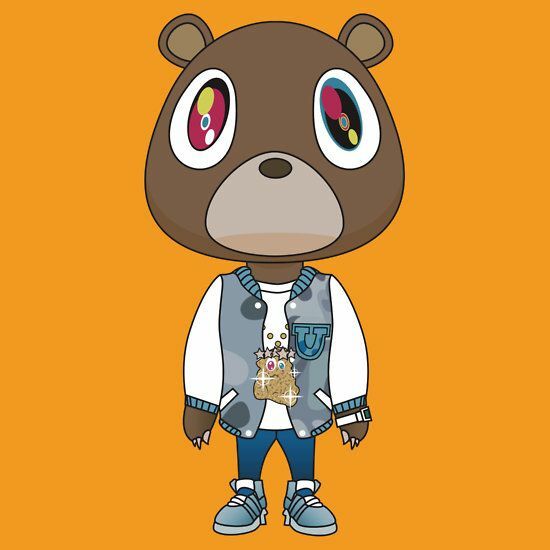 Before long, ‘Ye compiled a collection of his choice of beats and samples, and stepped up to rapping them himself. 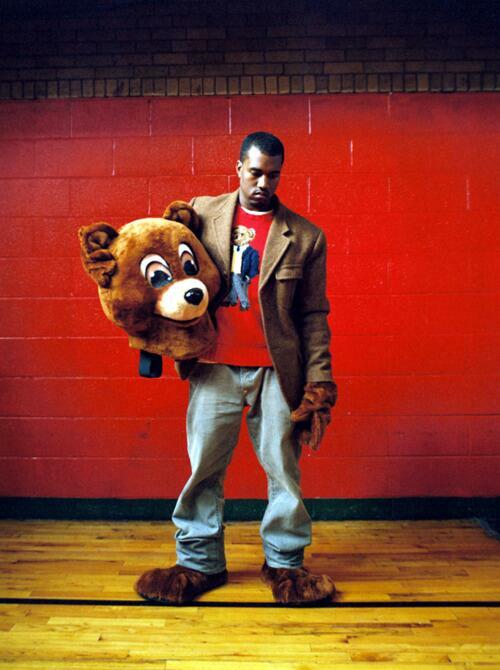 In 2004, the release of the College Dropout announced the arrival of Mr. West, the artist. His image was clean, his tunes melodic, and his lyrics have changed from the usual “gangster rap.” An ambitious new era in hip-hop has arrived. Seemingly overnight, Kanye shot on top of the music business. The awards piled up, and so did an oddly long queue of collaborations. The man himself came of age, swapping prep for swag, embracing the good life of fast cars, blings, and babes. Empowered by sales and acclaim, he used his fame to speak out of the injustice he saw around him. The plight of black Americans after Hurricane Katrina, the horrors of the blood diamond trade, and Taylor Swift winning best video of course. Then, Kanye’s tabloid notoriety went stellar when he made an honest woman out of reality TV star, Kim Kardashian. Thus the birth of KimYe. Fashion was Kanye’s next obsession. Ralph Lauren, Gucci, and even Prada were on his sights as he planned to march in London, Paris, and Milan if he could just find a way in. All these frustrations fueled a shift to a darker, harder Kanye West. He wanted to have his own line, his own design, his own brand name. It was Nike who was the first to give him his wish of collaboration. After a successful debut album in 2005 (arguably his 2nd best ever, after “My Dark Twisted Fantasy“), the sneaker corporate giant surprised him and his friends with the unreleased Nike Air 180 “College Dropout.” It was more than a gift for Kanye; it was an invitation to join the powerhouse. 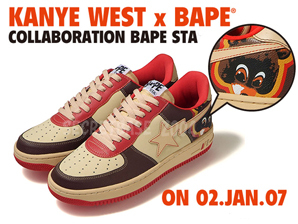 His first official partnership though was with Bathing Ape, who released the Kanye-designed Bapesta trainers in 2007, that looked like Nike Air Force 1s with his famed “Dropout Bear” branding instead of the swoosh. He loved it. 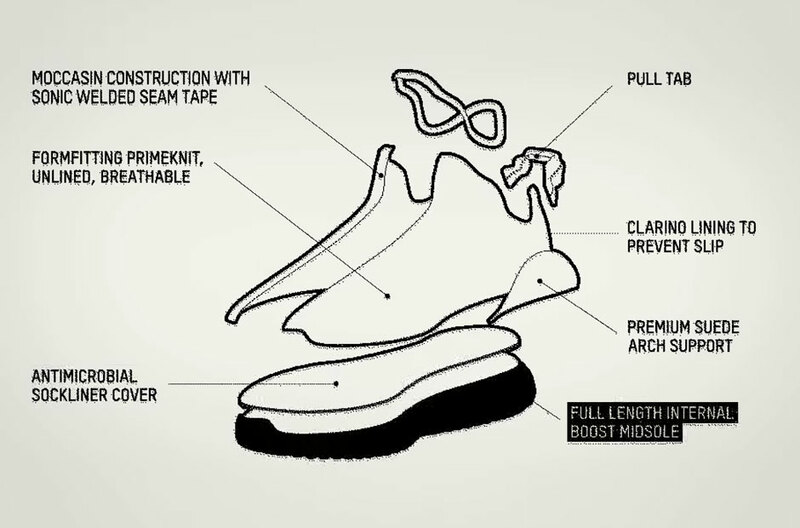 From the process, to the design, Kanye finally had a shoe he can call his own. He would help design Reebok‘s S. Carter line, releasing the Dropout edition for the Reebok S. Carter CL Low pairs with Jay-Z the following year. That wouldn’t be the biggest sneaker story of 2008 though. 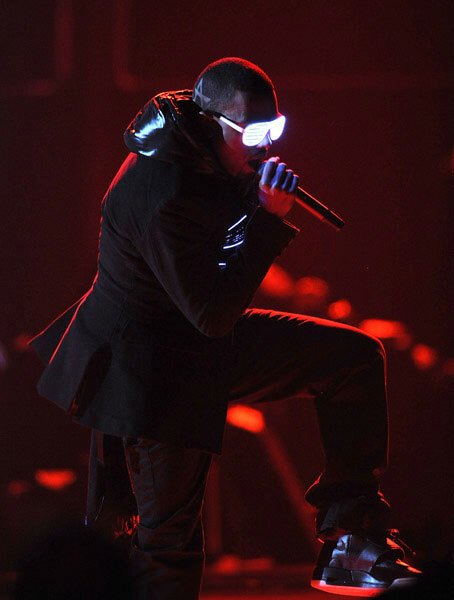 The 2008 Grammy performance was not only a golden moment for Kanye West, who was paying tribute to his late mother Donda West, but it also became one of the sneaker world’s most memorable event in history. The Nike Air Yeezy 1 was born, and it became an instant classic. Whether you were a reseller or a collector, the Yeezys were a must have. Nike was ecstatic to have him on the roster. But they didn’t realize soon enough that the success of the Yeezys fueled his fire, that would make him the X-factor in the billion dollar sneaker market. Fresh off the successful Air Yeezy launch, Louis Vuitton came knocking on Kanye’s door in 2009, and awarded him his own exclusive line – the creation of the Don’s, Jasper’s, and Hudson’s. Priced from $800 to $1,000, they still managed to sell out of stores, now fetching at least $5,000 in the after market. He called them out a couple of years later, for how the luxury brand priced them at a luxury point. This is coming from the same man that sold a plain white shirt with A.P.C. for $120, and dissed H&M and Zara for pricing their quality products very cheap. He never realized it before, but companies were taking advantage of him. The companies knew his influence was getting stronger, and they were in the right time with the right person to profit from. Mr. West was becoming a marketing tool for them – limit the supply, raise the price, and the demand will still follow. It was a dream for every fashion brand out there, may they be urban, sports, or luxury. 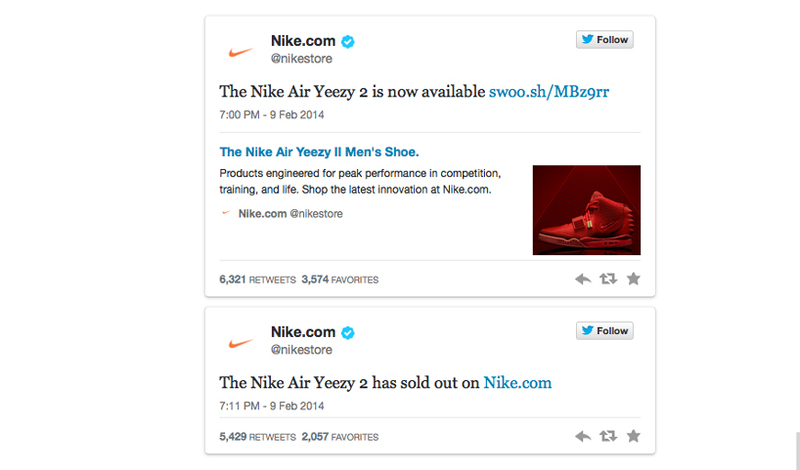 The anticipation for the sequel to the Nike Air Yeezy 1 was on an all-time high. The shoe first appeared in a promo ad by Nike for Kobe Bryant’s 6th signature in 2011, confirming the long speculation that there will be a Nike Air Yeezy 2 (in a Black/Solar Red colorway). Kanye headlined the Coachella in the same year, still wearing the holy grails along with an all-red outfit he rocked on stage. He continued rocking the Yeezy 2 during his “Watch the Throne” tour with Jay-Z, and even wore a Wolf Grey Air colorway, prompting speculation that there will be at least 2 colorways involved. Nike officially launched the shoes on June 9, 2012. 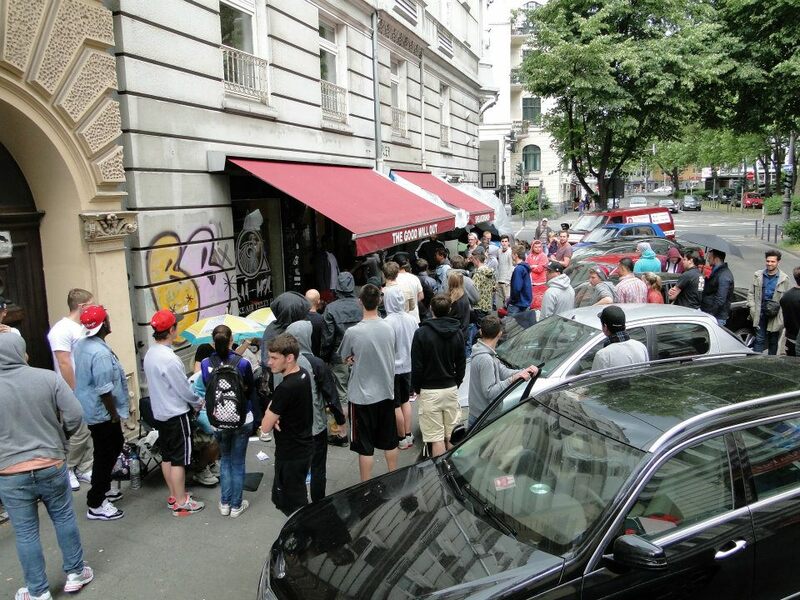 Some had camped out days before the release, while other stores raffled the limited edition pairs. The company reportedly released around 5,000 pairs of each color way, and the $245 shoes were reaching absurd resell value upwards of $4,000. He threw a subtle shot to the famed Michael Jordan Nike signature by dropping this line in New God Flow with Pusha T – “Hold up, I ain’t trying to stunt, man. But the Yeezys jumped over the Jumpman.” He was more valuable than any signature shoes there was available on the market at that time. And he launched hit after hit after hit on the radio, to recover from a fallen idol, to an icon. Kanye’s partnership with Nike would take a hit after the rapper accused the conglomerate of holding his royalties. The company argued that he was more of a designer than a “professional athlete,” thus they can’t pay him as an endorser. The contract impasse forced Nike to sign Drake, who was making a name for himself with the OVO brand. Kanye switched to adidas, a struggling competitor of Nike who was recently been dethroned by Skechers as the #2 sneaker brand in the pivotal US market. Nike would continue to release the Air Yeezy 2 “Red October,” West’s last pair with the brand. While Nike managed to move on easily with him, adidas gave Kanye the control that he wants. He is reportedly on a $10 million a year contract with the 3 stripes brand, while also receiving royalty fees in the 5% range. adidas even gave him the opportunity to work on his own clothing line. If they want to cause a ripple in the sneaker market, Kanye was their key. The Yeezy Boost gave a far different look and style than its predecessors from Nike. While the Air Yeezys were a standout, the Yeezy Boost were much more subtle. In producing the pair, adidas and Kanye focused on simplicity and functionality. The 750s featured a minimized contruction of the lacing system, but still had the iconic strap as an ode to the previous Yeezy models. The perforated vamp provided additional breathing, high quality full suede provided a more luxury feel, and it featured adidas’ latest cushioning technology – BOOST. The 350s were a $150 cheaper than the high-top model, but still had the high-end quality that has always been accustomed on every Kanye West products. To cap off his Yeezy Season 1, he’s bound to release his 7th studio album, SWISH with Apple Music. Once again, the world is waiting for what he has in store. I’ve been standing for almost 2 hours now, and finally the raffle was underway. They called the first winner, and everyone was happy for him. 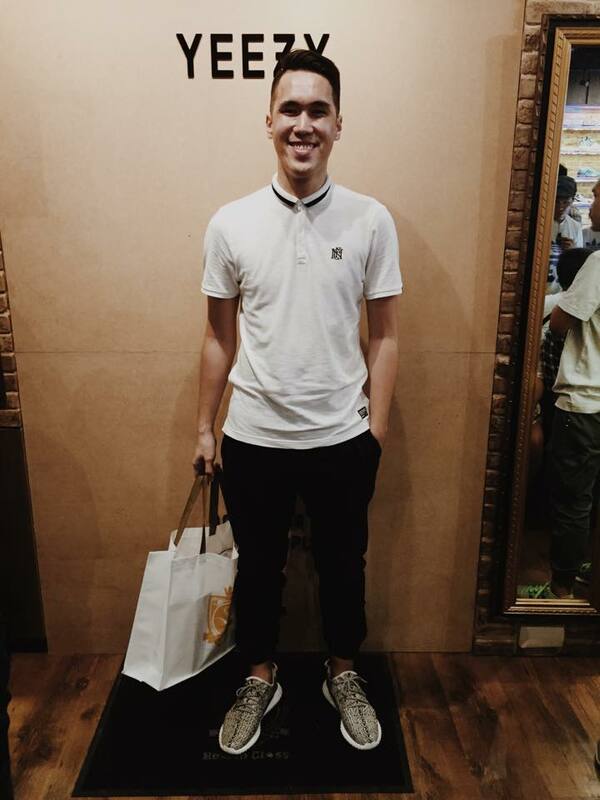 We were all giving him a round of applause for being the first Filipino to buy the Yeezy Boost 350. The suspense was killing us though. They kept calling names, and for each pair that was given, everyone was becoming more anxious. Sole Academy did a great job of not disclosing the actual number of Yeezy pairs on hand. 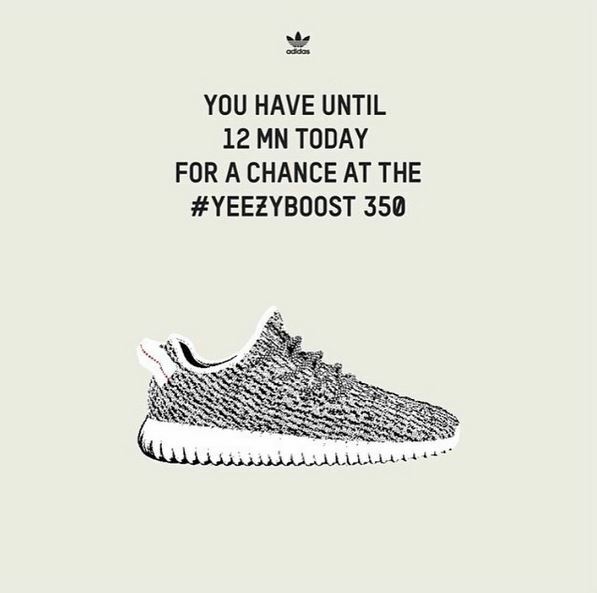 It was probably on the 15th pair that they announced that size 10s of the Yeezy Boost 350 were already out of stock. Everyone was disappointed. I had my name under the size 10 (I’m an 11, but there were some blogs that I’ve read before that suggested going a full size down) during registration and I thought my chances of having my first Yeezy have disappeared. But after going through a tedious process of getting a raffle through SA and adidas’ Instagram contest and waiting a couple of hours until the raffle, I couldn’t give up just yet. 5 pairs after, they called my name. I entered the store, showed them my validation and registration codes, and the staff asked me to take a seat along with the other fellow winners. The experience was surreal. I was so close to getting my own Yeezy pair. One of the staff asked me what my size was. I told him I registered under 10, but I could try 11. He got the box, and he even removed my adidas Pure Boost “Predator” on his own. He got the Yeezy Boost 350 out of the box, and I still couldn’t appreciate it properly with all the adrenaline rushing through my veins. I was about to fit the shoe, but the whole lining at first wasn’t big enough that I couldn’t insert it properly (that’s what she said). After a moment of struggle, the Yeezy Boost was finally on my feet. They took my picture, and bid thank you and good bye to the staff and the winners for an amazing experience. As I walked out of the store, everyone was just looking at my feet, that I felt a bit insecure yet still proud to have it. I kept saying to myself, “So this is what it feels like to have a Yeezy pair.” I finally have a Yeezy that I can call my own. Just when I thought I was out, the sneaker game pulled me back in. All thanks to a jackass named Kanye West. This entry was posted in Kicks and tagged adidas, adidas Boost, adidas Originals, adidas Yeezy, Blog, Fresh Off the Box, Kanye, Kanye West, kicks, Nike, Nike Air Yeezy, shoe market, Sneaker head, Ye, Yeezy, Yeezy Boost, Yeezy Boost 750. Bookmark the permalink.